It is important to tell the story of the Constitution’s origins in a way that demythifies it. Impressive as they were, the men who wrote the Constitution were not demigods; they had interests, prejudices, and moral blind spots. 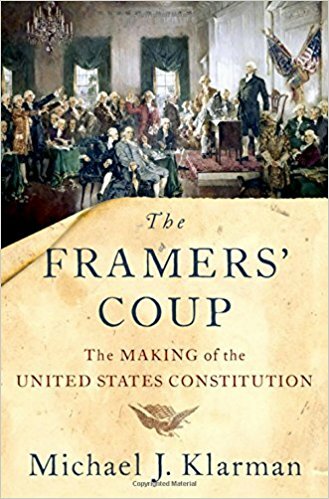 Excerpted from The Framers' Coup: The Making of the United States Constitution, by Michael J. Klarman. More information. Invocations of divine inspiration for the Constitution by supporters of ratification were, at least in part, a conscious political strategy to maximize the chances of winning. At the convention itself, Madison had explained, “The respectability of this convention will give weight to their [the delegates’] recommendation of it.” During the ratifying contest in Virginia, he told Governor Edmund Randolph, “Had the Constitution been framed and recommended by an obscure individual, instead of a body possessing public respect and confidence, there can not be a doubt that although it would have stood in the identical words, it would have commanded little attention from most who now admire its wisdom.” In the days immediately following the Philadelphia convention, as Alexander Hamilton mulled the prospects of ratification, he similarly observed that one important Federalist advantage was the influence of those who framed the Constitution— and especially that of George Washington. It is important to tell the story of the Constitution’s origins in a way that demythifies it. 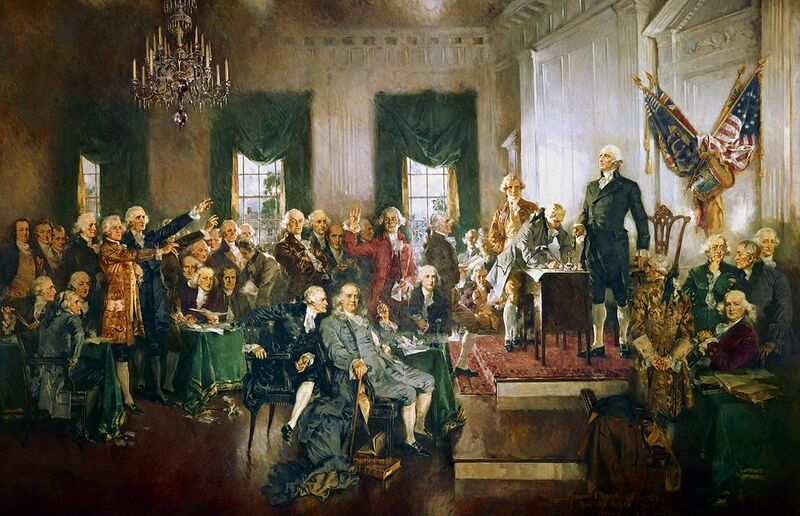 The men who wrote the Constitution were extremely impressive, but they were not demigods; they had interests, prejudices, and moral blind spots. They could not foresee the future, and they made mistakes. As we shall see, the Articles of Confederation— the system for governing the United States that preceded the Constitution— suffered from a variety of flaws. Most important, under the Articles, Congress lacked the power to levy taxes, to regulate interstate or foreign commerce, and even to enforce national treaties against recalcitrant states. Efforts to redress these flaws prior to the Constitutional Convention of 1787 proved unavailing. Several amendments to the Articles were proposed, but particular states had interests that led them to block the proposals, which in turn inspired resentment and spawned retaliatory actions by other states. A dispute over Secretary for Foreign Affairs John Jay’s negotiations with Spain involving Americans’ claim to navigation rights on the Mississippi River created deep sectional divisions that seemed to threaten the survival of the union and indeed led some statesmen to fear civil war. The Constitution was much more than simply a response to certain widely perceived defects in the Articles of Confederation. Yet the Constitution was not simply a response to certain widely perceived defects in the Articles of Confederation. To a considerable degree, it was also a response to economic conflicts that had developed in the states in the mid-1780s. In the midst of a severe postwar economic recession, a majority of states enacted measures for tax and debt relief, which were reviled by most of the nation’s political and economic elite and soured them on political arrangements that they deemed overly responsive to public opinion. In one of the states where popular demands for relief legislation were defeated— Massachusetts— debtors and taxpayers arose in insurrection and closed the civil courts in an effort to prevent mass foreclosures and extort tax relief from the legislature. Many prominent statesmen were horrified by Shays’s Rebellion, which they saw as a broadscale assault on government and perhaps even on private property. To the extent that the Constitution was designed in part to block legislation for tax and debt relief, it represented a victory for one party in a debate that genuinely had two sides— which was less true with regard to the aspects of the Constitution that redressed flaws in the Articles of Confederation, where a powerful consensus existed for remedial measures. Shays’s Rebellion also had a profound impact on the Philadelphia convention and its handiwork. A constitution written in the years before Shays’s Rebellion and the enactment of populist relief legislation by many states probably would have looked very different from the one drafted in Philadelphia. In the 1780s, several unsuccessful efforts had been made to reform the Articles incrementally. How was the decision made to pursue more radical reform through an open-ended constitutional convention, which the Articles did not authorize? With the aid of hindsight, many of the steps leading to the Philadelphia convention seem fortuitous. What might have happened had no such convention taken place in 1787? Many statesmen observed that the Confederation Congress was on the brink of collapse and the union on the edge of dissolution. They predicted that the demise of the Confederation probably would lead to civil war and might induce Americans to lose their faith in republican government. Were such statements simply rhetoric designed to frighten people into supporting drastic constitutional reform, or were they plausible predictions of what might have happened had the Constitution not been drafted and ratified when it was? Chapter 3 examines the constitutional convention that assembled in Philadelphia in May 1787, including how its agenda got set and how the principal issues it addressed got resolved. As we shall see, from the outset the convention was beset by deep conflict. Delegates disagreed about ideas (such as the nature of political representation and the ideal structure of an executive branch), but they also had conflicting interests (such as over the relative power that small and large states should exercise within the national legislature). While the delegates mostly argued over issues in terms of political principles, often their ostensibly principled arguments simply served as rationalizations for the interests being advanced. For weeks, the delegates struggled over the convention’s most intractable issue: how to apportion representation in the national government in a manner that was acceptable to both large and small states. This chapter examines the arguments that informed that debate, the extent to which the convention nearly dissolved over it, and the compromise that eventually resolved the issue. In the end, the Philadelphia convention designed a constitution that dramatically expanded the powers of the national government while insulating it far more from popular political influence than most Americans at the time would have anticipated or desired. That is why the battle over ratification was so closely fought. Chapter 3 also investigates why the convention proved so unrepresentative of public opinion in the nation: What were the circumstances and decisions that created the conditions enabling the delegates to write the constitution they did? As delegates from large states and small states battled over how to apportion representation in Congress, Madison observed more than once that the real conflict of interest among the states at the convention was a function of their differing degrees of dependence on slave labor. Chapter 4 examines the role that debate over slavery played in Philadelphia. Although there was probably never a serious possibility that the convention would take significant steps toward the abolition of slavery, delegates from slave states and from (mostly) free states found plenty to disagree about at the convention. In the several compromises over slavery that enabled the Framers to agree upon a constitution, did northerners make the best possible bargains, or were they unduly intimidated by the southern delegations’ repeated threats to walk out of the convention if their slavery- related demands were not satisfied? In the contest over ratification of the Constitution, some northern Federalists argued that the Constitution put slavery on the road to extinction. By contrast, many of their southern allies argued that the Constitution was a strongly proslavery document. Which of these claims was nearer to the truth? Slavery, of course, was not the only issue— or even one of the principal ones— in the ratifying contest. Chapter 5 examines the debate over ratification more broadly: What arguments did Antifederalists make in opposition to ratification, and how did Federalists respond? In defending particular constitutional provisions, how closely did Federalists’ arguments during the ratifying contest track those made by the Framers at the Philadelphia convention? Arguments made against ratification did not, of course, necessarily reflect the underlying interests motivating the opposition. Some reasons for opposing the Constitution were widely seen as more legitimate than others. Moreover, those who had decided to oppose ratification had an incentive to make whatever arguments seemed most likely to convince swing voters and ratifying convention delegates to reject the Constitution. In addition to considering the arguments made against the Constitution, chapter 5 investigates the factors that actually seem to have influenced positions on ratification. Although Federalists and Antifederalists sometimes simply held different ideas about government, interests having to do with class, occupation, and the size and circumstances of one’s state and region— East versus West, North versus South, and urban versus rural— seem to have proved more important in determining votes on ratification. The Framers had written a constitution that vastly expanded the powers of the federal government and constrained populist influence upon it. How did Federalists manage to convince Americans, through a reasonably democratic process, to approve a constitution that seemed to contravene their preferences in many ways and that significantly curbed democracy at the national level? Chapter 6 examines the process of ratification, which in some ways was not entirely a fair fight. Federalists enjoyed certain advantages, some of which were the result of luck but others of which they had helped to construct. For example, in some states, malapportionment of ratifying conventions worked to the Federalists’ advantage. In nearly all states, the press was overwhelmingly on the Federalists’ side of the debate, and the economic and educational elite also generally favored ratification. One of the Federalists’ most important advantages was Article VII of the Constitution, which eliminated the requirement from the Articles of Confederation that constitutional change be unanimously approved by the states and stipulated instead that the acquiescence of nine states would suffice to put the Constitution into operation (although those states could bind only themselves). Only by changing the existing ground rules— and getting their opponents to acquiesce in the new ones— were the Federalists able to give themselves a fighting chance in the ratifying contest. Yet, in the end, they probably still would not have won without some important strategic blunders by their adversaries. Chapter 6 also describes the ratifying contest as it unfolded state by state, noting the importance of momentum shifts, tactical choices made by the two sides, and the contingency of the outcome, which was very much in doubt for most of the contest. Although the issue of whether the Constitution would be ratified was one of the most important in the nation’s history, the contest over ratification was, perhaps to a surprising degree, fought largely with the weapons of ordinary politics. Both sides questioned their opponents’ motives and attacked their characters, appealed to the material interests of voters, employed dirty tricks, and made back- room deals when necessary. Throughout the ratifying contest, Antifederalists made arguments— many of them quite persuasive— for ratification conditional upon antecedent amendments, and for a second constitutional convention that would consider amendments proposed by the state ratifying conventions. Federalists adamantly resisted both conditional ratification and a second convention, offering both legal and practical political arguments for their position. But those arguments did not fully capture the reasons the Federalists were so averse to such proposals. In the end, most Americans probably would have preferred a constitution lying somewhere on the spectrum between the obviously defective Articles of Confederation and the vastly more nationalist and democracy-constraining Constitution. Yet the Federalists managed to deny them any intermediate options. The original Constitution contains no bill of rights— a striking omission from the perspective of most Americans, then and now. Chapter 7 examines how a bill of rights came into existence. In this part of the Founding story, as elsewhere, Madison played an enormously important role. How did he evolve from an opponent of all amendments to the Constitution, during the ratifying contest, to the great champion of the Bill of Rights? And how did Madison convince the first Congress to adopt constitutional amendments when most Federalists had little enthusiasm for the entire project of amendments and most Antifederalists had little interest in the particular amendments that Madison proposed? Throughout the ratifying contest, Antifederalists raised challenges to the legitimacy of the Constitution: Congress had exceeded its authority by endorsing the Philadelphia convention; the convention had ignored its limiting instructions; and the Articles required that amendments be approved unanimously by state legislatures, yet the Constitution stipulated that it would become [CHECK] oper-se were substantial irregularities in the process of constitutional change, yet, once the new national government had commenced operations, Antifederalists quickly abandoned their legitimacy challenges. Chapter 8, the concluding chapter, considers why Antifederalists may have chosen to do so. One possibility is that the nation quickly prospered under the Constitution—and perhaps because of the Constitution. Another possibility is that former Antifederalists quickly discovered that, even while limited to operating within the Constitution’s bounds, they could still make essentially the same political arguments they had made in opposing its ratification. Indeed, for much of the period from 1800 to the Civil War, the Antifederalists’ ideological and political descendants seemed largely to control the Constitution’s interpretation, both within the political branches of the national government and in the Supreme Court (at least after the demise of Chief Justice John Marshall and his Federalist/ Whig compatriot justices in the early to mid- 1830s). Even though Antifederalists lost the contest over the Constitution’s ratification, they seem largely to have won the battle over its interpretation— at least until after the Civil War. * For the convenience of readers, I have modernized spelling, capitalization, and punctuation in quotations, while attentive to the need not to alter the speaker’s meaning. I have also expanded abbreviations in a similar manner. 1. Benjamin Franklin at Philadelphia convention, Sept. 17, 1787 (Madison’s Notes), in The Records of the Federal Convention of 1787 (Max Farrand, ed., rev. ed. 1966), 2:642 [hereinafter, “Farrand”]. Madison’s notes from the Philadelphia convention are the most extensive, but several other delegates also took notes. All subsequent references to Farrand are to Madison’s notes, unless specifically noted otherwise. 2. New York Times, Mar. 7, 1928, p. 27; Michael Kammen, A Machine that Would Go of Itself: The Constitution in American Culture (New York, 1986), 225; Robert A. Dahl, How Democratic Is the American Constitution? (New Haven, CT, 2nd ed. 2003), 122; Sanford Levinson, Constitutional Faith (Princeton, NJ, 1988), 14; see also Jack N. Rakove, Original Meanings: Politics and Ideas in the Making of the Constitution (New York, 1996), 367; James H. Hutson, “Country, Court, and Constitution: Antifederalism and the Historians,” William and Mary Quarterly (July 1981), 38:342. 3. The Federalist No. 37 (Madison), at 230– 1 (Clinton Rossiter, ed., New York, 1961) (“[I]t is impossible”); Madison to Jefferson, Oct. 24, 1787, The Papers of James Madison (Congressional Series) (Robert R. Rutland and William M. E. Rachal, eds., Chicago, 1977), 10:208 [hereinafter, “PJM (C.S. )”] (“consider the degree”); see also Richard Beeman, Plain, Honest Men: The Making of the American Constitution (New York, 2009), 179. 4. “The Landholder” X, Connecticut Courant, Mar. 3, 1788, The Documentary History of the Ratification of the Constitution (John P. Kaminski and Gaspare J. Saladino, eds., Madison, WI, 1986), 16:306 [hereinafter, “DHRC”] (“[t]he unexpected harmony”); David Ramsay, Oration, Charleston Columbian Herald, June 5, 1788, DHRC, 18:160 (“Heaven smiled”); Rush at Pennsylvania convention, Dec. 12, 1787, DHRC, 2:593 (“the hand of God”); Benjamin Rush, Observations on the Fourth of July Procession in Philadelphia (July 15, 1788), DHRC, 18:266 (“as much the work” and “of heaven”); see also Levinson, Constitutional Faith, 13; Beeman, Plain, Honest Men, 179. 5. Madison at Philadelphia convention, June 12, 1787, Farrand, 1:215 (“The respectability”); Madison to Randolph, Jan. 10, 1788, PJM (C.S. ), 10:355 (“Had the Constitution”); Alexander Hamilton, Conjectures About the New Constitution (Sept. 17– 30, 1787), DHRC, 13:277. 6. Pennsylvania Gazette, Aug. 22, 1787, DHRC, 13:190 (“[s]uch a body” and “entitled”); “An Admirer of Anti- Federal Men,” New York Daily Advertiser, July 26, 1787, DHRC, 19:15 (“surely will never,” “[r]est assured,” “worthies,” and “have the good”). For other such statements made while the convention was still sitting, see, e.g., “An American,” Massachusetts Centinel, Aug. 4, 1787, DHRC, 13:185; “Observator” V, New Haven Gazette, Sept. 20, 1787, DHRC, 3:349; see also John K. Alexander, The Selling of the Constitutional Convention: A History of News Coverage (Madison, WI, 1990), 27– 8, 58– 62, 202– 4, 213– 4. Even Jefferson, who was harder to impress, referred to the convention as “an assembly of demigods”; to John Adams, Aug. 30, 1787, The Papers of Thomas Jefferson (Main Series) (Julian P. Boyd et al., eds., Princeton, NJ, 1955), 12:68 [hereinafter, “PTJ (M.S.)”]. 7. Pennsylvania Packet, Sept. 22, 1787, DHRC, 13:222 (“[b]ear witness”) (emphasis in original); New York Daily Advertiser, Sept. 24, 1787, DHRC, 19:51 (“the duty” and “to cultivate”); Alexander White, “To the Citizens of Virginia,” Winchester Gazette [Virginia], Feb. 29, 1788, DHRC, 8:443– 4 (“a Washington,” “whose philosophical,” and “could conspire”). For additional uses of this rhetorical technique by Federalists, see, e.g., A Citizen of New-York: An Address to the People of the State of New York (John Jay) (Apr. 15, 1788), DHRC, 20:931; Essex Journal, Nov. 21, 1787, DHRC, 4:292; Massachusetts Centinel, Nov. 10, 1787, ibid., 214. 8. “Centinel” I, Philadelphia Independent Gazetteer, Oct. 5, 1787, DHRC, 13:330 (“too apt to yield”); “Sydney,” Albany Gazette, Jan. 24, 1788, DHRC, 20:646 (“as infidels” and “their approbation”); Findley to William Irvine, Mar. 12, 1788, DHRC, 16:374 (“addressing our reason” and “address[ing] our implicit faith”); Elbridge Gerry to the Massachusetts General Court, Massachusetts Centinel, Nov. 3, 1787, DHRC, 13:549 (“that an implicit confidence” and “however respectable”). For other similar Antifederalist statements, see “Centinel” VIII, Philadelphia Independent Gazetteer, Jan. 2, 1788, DHRC, 15:233; “Centinel” XV, Feb. 22, 1788, ibid., 16:190; Consider Arms, Malachi Maynard, and Samuel Field: Dissent to the Massachusetts Convention, Northampton, Mass. Hampshire Gazette, Apr. 16, 1788, DHRC, 17:52– 3; “An Officer of the Late Continental Army” (possibly William Findley), Philadelphia Independent Gazetteer, Nov. 6, 1787, DHRC, 2:214; “The Republican Federalist” II, Massachusetts Centinel, Jan. 2, 1788, DHRC, 5:590–1; “Rusticus,” New York Journal, May 23, 1788, DHRC, 20:1108– 9; Luther Martin, Genuine Information I, Baltimore Maryland Gazette, DHRC, 11:133. At the Massachusetts ratifying convention, one Antifederalist, Samuel Nasson, confessed that, given “the list of illustrious names annexed to it,” he was “suspicious of [his] own judgment” when he viewed the Constitution as “pregnant with danger” (Massachusetts convention, Feb. 1, 1788, DHRC, 6:1397). For the references supporting the preceding footnote, see “A Citizen of Philadelphia” (Pelatiah Webster), Pennsylvania Gazette, Jan. 23, 1788, DHRC, 2:658 (“Can human nature”); “Cassius” V, Massachusetts Gazette, Nov. 30, 1787, DHRC, 4:340 (“unprincipled” and “who for eight years”); see also Olney Winsor to Mrs. Olney (Hope) Winsor, Mar. 31, 1788, DHRC, 8:523. 9. Kammen, Machine that Would Go of Itself, 142, 315. 10. Ibid., 68 (“fetishism”), 205 (“fetishism”); Jefferson to “Henry Tompkinson” (Samuel Kercheval), July 12, 1816, The Papers of Thomas Jefferson (Retirement Series) (J. Jefferson Looney, ed., Princeton, NJ, 2014), 10:226 [hereinafter, “PTJ (R.S. )”] (“a wisdom” and “constitutions”). 11. The Federalist No. 49 (Madison), at 314– 5 (quotations); see also Madison to Jefferson, Feb. 4, 1790, PJM (C.S. ), 13:19; Drew R. McCoy, The Last of the Fathers: James Madison and the Republican Legacy (New York, 1989), 54– 8; Rakove, Original Meanings, 140–1. 12. Michael Vorenberg, Final Freedom: The Civil War, the Abolition of Slavery, and the Thirteenth Amendment (Cambridge, England, 2001), 107– 8 (“stood around” at p. 108); Kammen, Machine that Would Go of Itself, 191 (“greatest jewel”), 219– 23, 283 (“Shrine of the Constitution”); Jeff Shesol, Supreme Power: Franklin Roosevelt vs. the Supreme Court (New York, 2010), 107– 8. 13. Kammen, Machine that Would Go of Itself, 24.